Imagine you gave your fiancée an engagement ring that cost over $10,000. After three months, your fiancée returns the ring to you and breaks off the engagement. You return to the jeweler with the ring and try to sell the ring back. You are only offered $3500. What do you do? This happened to Josh Opperman. All he had left was the fancy ring he had worked so hard to save up for. What could he do? He thought what happened to him must happen to other people. There must be a population of people who bought expensive jewelry for someone and were rejected. Then when they tried to return the jewelry were shocked at the way less than the purchase price jewelers offered for the item. He saw this as a possible business opportunity. He started a business called I Do Now I Don’t. It is an e-commerce site that allows people to sell gently used engagement rings or any other fancy jewelry and other accessories to other users for way less than going to a jewelry store. He created a unique opportunity where sellers receive more money than ever thought possible, while at the same time the buyers can buy diamonds and jewelry at below retail prices; for the first time ever, a unique model that adds value to both sides of the equation. His idea has been featured on CNN, The Today Show, Fox News, and in The New York Times. Thomas Edison put it this way: “Make it a habit to keep on the lookout for novel and interesting ideas that others have used successfully. Your idea needs to be original only in its adaptation to the problem you are working on.” Josh’s new business is basically an adaptation of Craig’s List used for the buying and selling of gently used jewelry. Another example of adaptation comes from the medical field. Dr. Peter Pronovost, a critical care specialist at the Johns Hopkins medical center in Baltimore, thought he knew how to minimize human error. It was, as Dr. Atul Gawande describes it in his provocative new book, “The Checklist Manifesto,” an idea so simple that it seemed downright loopy. Learn the techniques creative geniuses have used to create ideas. Years back, I submitted my first manuscript Thinkertoys: A Handbook of Creative Thinking Techniques to commercial publishers. All the major publishers responded that they did not review manuscripts that were not represented by agents. When I approached the major agents, I was told that they not represent anyone who was not published. It was a classic Catch-22. I regarded this as simply another challenge to be overcome. I thought about the creative thinking techniques used by Leonardo da Vinci that I researched and wrote about in my book Cracking Creativity (The Secrets of Creative Genius). He believed that it is impossible for the human mind to deliberate on two separate ideas or objects, no matter how dissimilar, without eventually forming a connection between the two. These connections give you a different way to focus on the information and a different way to interpret what you are focusing on which leads to creative ideas that you cannot get using your usual way of thinking. Leonardo called this technique “connecting the unconnected.” A blueprint for how to use this technique is in my book and includes several different ways on how to find random subjects that are unrelated to your challenge. One way uses a visual picture or illustration that you randomly select. Accordingly, I took out a deck of Tarot cards (Gypsy fortune-telling cards). The cards are beautifully illustrated and titled such as “Tower,” “the Moon, “the Fool,” and so on. I shuffled the deck, closed my eyes, and randomly pulled out a card. The card I pulled was the “Death” card. Intrigued, I began to wonder what connections there were between death and getting a publisher to read my manuscript. What does death have to do with publishers reviewing manuscripts? I thought of death: the causes, grieving, burials, rituals, memorial services, the undertakers, decomposition, cultural attitudes, wakes, preparations for burial, epitaphs, gravestones, eulogies, obituaries, and so on. The card also displayed death wearing a suit of armor and appearing majestically powerful to the people he approached. Death means leaving one’s loved ones and friends behind. Death appears in the picture as a knight wearing shining armor facing people who are fearful. Leaving one’s friends behind made me think of editors leaving one publisher for a better position with a competing publisher. I also assumed the editors who left for more prestigious jobs with other companies were highly valued by their previous companies. Human nature being what it is, perhaps, the departing editor left his former boss and co-workers jealous and resentful. Perhaps they were not willing to help or assist him succeed at his new company. Then I got my idea. I went to the library and looked up Publisher’s Weekly, the publishing industry journal. Inside I found a section titled “People on the Move.” It described people’s movement in the industry. I discovered that one of the editors (I’ll refer to him as Tom) at Random House had moved on to become publisher for a competing company. I became interested in the people he left behind at his former publisher. My manuscript that your editor Tom X was so excited about is finally finished. I promised Tom that I would submit the manuscript to him as soon as I finished it. However, I cannot locate Tom X. Your company’s receptionist told me he is no longer employed by your company and was not able to give me his current address. I would very much appreciate it if you would please let me know how and where I can contact him so I can deliver my promised manuscript. I sent this letter to three different publishers about three different editors who had accepted better jobs with other publishers. All three publishers demanded the manuscript immediately. One called and threatened me with a lawsuit unless I delivered the manuscript to them ASAP. All three wanted the publishing rights and got into a bidding war for the contract. I received a lucrative advance from the high bidder. All offers were from companies who claimed they would not review manuscripts not represented by agents. They all ended up bidding against each other for a manuscript that was not represented by an agent. Thank you, Leonardo da Vinci, for showing me once again how to get the unconventional idea by connecting the unconnected. The Greek philosopher Democritus (460-370 BC) promulgated the atomic theory, which asserted that the universe is composed of two elements: the atoms and the void in which they exist and move. Many contemporary historians of the philosophy of science consider Democritus to be the “father of modern science” because of his stunning insight about the universe centuries before our understanding of atomic structure, which did not occur until the early 19th century. All of his ideas were rejected by all of the Greek philosophers and scientists at the time because his beliefs contrasted with those of Aristotle who, according to his followers, was the ultimate authority about the universe. Their commitment to Aristotle and his theories about the universe caused them to feel a great uncertainty in imagining any other possibility. Plato is said to have disliked him and his atomic theory so much that he wished all his books burned. Democritus was ignored by the Athens intellectual community for the rest of his life. Did the ancient Greeks desire creative ideas? Yes. They prided themselves for their creativity in the arts, science and society. They proclaimed Greece as the “enlightened society,” and built architectural monuments to their creativity. Yet the rejection of Democritus is just one of many historical examples of breakthrough ideas that were automatically rejected because of their novelty and their nonconformance with existing beliefs which caused a general feeling of uncertainty. History also recounts how physicists could not see Einstein’s theory of relativity because of their established, accepted views. For years, they tried to incorporate his view into the established view without success. Interestingly, the skeptical physicists never did accept his theory, instead they eventually died and subsequent generations of physicists who were not prejudiced by the past were able to accept and understand Einstein. What we learn from history is that our established view interferes with our perception and understanding of new ideas and concepts. Do people desire creative ideas and innovation today? Most us would answer with a loud ‘YES, OF COURSE’ asserting that creativity is the engine of discovery in the arts, science and industry, and is the fundamental driving force of positive change, and is associated with intelligence, wisdom, and goodness. Still while most people strongly endorse a positive view of creativity, historians have discovered that scientific institutions, business, education, medical, military, nonprofit, political organizations, and leaders and decision-makers in all fields routinely reject creative ideas much like the Greeks rejected atomic theory. • Fred Smith’s Yale University management professor gave Fred a ‘C’ because Fred’s paper proposal to provide overnight delivery service was not a feasible business idea. Fred’s proposal became Federal Express. Incidentally, every delivery expert in the U.S. doomed FedEx to failure as they said no one will pay a fancy price for speed and reliability. • Charles H. Duell, Commissioner, U.S. Office of Patents, 1899 said.”Everything that can be invented has been invented.” He urged the closing of the patent office as there no longer was a need for it. • “The wireless music box has no imaginable commercial value. Who would pay for a message sent to nobody in particular?” said David Sarnoff’s associates, in response to his urgings for investment in the radio in the 1920s. • “TV won’t be able to hold on to any market it captures after the first 6 months. People will soon get tired of staring at a plywood box every night.”(Darryl F. Zanuck, head of 20th Century Fox, 1946). • “Airplanes are interesting toys for hobbyists but of no military value.”(Marshal Ferdinand Foch, Professor of Strategy, Ecole Superieure de Guerre / French commander of Allied forces during the closing months of World War I, 1918). Once people establish a hypothesis about the way things are, they develop a deeply-rooted bias against anything that causes them to feel uncertain, anxious or confused about their pre-established hypothesis. This bias against uncertainty is activated when people are asked to evaluate new, novel ideas and interferes with the participants’ ability to recognize a creative idea. The insidious nature of this bias is that there is strong societal pressure to endorse creativity and its products and a strong social desirability bias against expressing any view of creativity as negative. The resulting state is similar to that identified in research on racial bias; a conflict between an explicit preference towards creativity and unacknowledged negative associations with creativity. So we say we strongly support creativity while routinely rejecting creative ideas and never admitting it. This is because creative ideas are novel and different which makes us feel uncertain and afraid. There is no such thing as failure. Failure is only a word that human beings use to judge a given situation. The artificial judgments of failure only keep you from trying something and erring or making a mistake. Yet those mistakes and errors are the way we learn and the way we grow. B.F. Skinner advised people that when you are working on something and find something interesting, drop everything else and study it. In fact, he emphasized this as a first principle of scientific methodology. This is what William Shockley and a multi-discipline Bell labs team did. They were formed to invent the MOS transistor and ended up instead with the junction transistor and the new science of semiconductor physics. These developments eventually led to the MOS transistor and then to the integrated circuit and to new breakthroughs in electronics and computers. William Shockley described it as a process of creative failure methodology. Richard Feynman, a Nobel Laureate physicist, had an interesting practical test that he applied when reaching a judgment about a failed idea: for example, did it explain something unrelated to the original problem. E.g., What can you explain that you didn’t set out to explain? And, What did you discover that you didn’t set out to discover? In 1938, 27 year old Roy Plunkett set out to invent a new refrigerant. Instead, he created a glob of white waxy material that conducted heat and did not stick to surfaces. Fascinated by this unexpected material, he abandoned his original line of research and experimented with this interesting material, which eventually became known by its household name, Teflon. F. W. Woolworth: Some may not know this name today, but Woolworth was once one of the biggest names in department stores in the U.S. Before starting his own business, young Woolworth worked at a dry goods store and was not allowed to wait on customers because his boss said he lacked the sense needed to do so. Woolworth also had many ideas of how to market dry goods – all of which were rejected by his boss. He quit and marketing ideas became the foundation of his phenomenal retail success with his own stores. Akio Morita: You may not have heard of Morita but you’ve undoubtedly heard of his company, Sony. Sony’s first product was a rice cooker that unfortunately didn’t cook rice so much as burn it, selling less than 100 units. The rice cooker was the object of scorn and laughter by the business community. This did not discourage Morita and his partners as they pushed forward to create a multi-billion-dollar company. Jack Canfield was rejected 144 times before he found a publisher for his book, Chicken Soup for the Soul. When Jack told the publisher he wanted to sell 1.5 million books in the first 18 months, the publisher laughed and said he’d be lucky to sell 20,000. That first book sold more than 8 million copies in America and 10 million copies around the world. Canfield’s book brand is now a $1 Billion brand. The artist genius of the ages is Michelangelo. His competitors once tried to set him up for failure or force him to forgo a commission because of the possibility of failure. Michelangelo’s competitors persuaded Junius II to assign to him a relatively obscure and difficult project. It was to fresco the ceiling of a private chapel. The chapel had already been copiously decorated with frescoes by many talented artists. Michelangelo would be commissioned to decorate the tunnel-vaulted ceiling. In this way, his rivals thought they would divert his energies from sculpture, in which they realized he was supreme. This, they argued, would make things hopeless for him, since he had no experience in fresco, he would certainly, they believed, do amateurish work as a painter. Without doubt, they thought, he would be compared unfavorably with Raphael, and even if the work were a success, being forced to do it would make him angry with the Pope, and thus one way or another they would succeed in their purpose of getting rid of him. Michelangelo, protesting that painting was not his art, still took on the project. In every way it was a challenging task. He had never used color, nor had he painted in fresco. He executed the frescos in great discomfort, having to work with his face looking upwards, which impaired his sight so badly that he could not read or look at drawings save with his head turned backwards, and this lasted for several months. In that awkward curved space, Michelangelo managed to depict the history of the Earth from the Creation to Noah, surrounded by ancestors and prophets of Jesus and finally revealing the liberation of the soul. His enemies had stage managed the masterpiece that quickly established him as the artist genius of the age. ……………………………………………………………………………………………………. . . . . .
Take one of your failed ideas and use the technique described in ThinkPak to elaborate and modify it into something new. Amaze yourself. Creativity, it could be said, consists largely of rearranging what we know in order to find out what we do not know. Rearrangement usually offers countless alternatives for ideas, goods, and services. Take ordinary words and rearrange the letters to create new words that will surprise and startle you. For example, if life gives you limes, rearrange the letters of limes into smiles. Rearrange the letters of Santa into? (Ans. at bottom). And finally, A BOOK THAT WILL TRANSFORM YOU INTO A CREATIVE THINKER makes you automatically think of THINKERTOYS (A HANDBOOK OF CREATIVE THINKING TECHNIQUES). How do geniuses come up with ideas? What is common to the thinking style that produced “Mona Lisa,” as well as the one that spawned the theory of relativity? What characterizes the thinking strategies of the Einsteins, Edisons, daVincis, Darwins, Picassos, Michelangelos, Galileos, Freuds, and Mozarts of history? What can we learn from them? For years, scholars and researchers have tried to study genius by giving its vital statistics, as if piles of data somehow illuminated genius. In his 1904 study of genius, Havelock Ellis noted that most geniuses are fathered by men older than 30; had mothers younger than 25 and were usually sickly as children. Other scholars reported that many were celibate (Descartes), others were fatherless (Dickens) or motherless (Darwin). In the end, the piles of data illuminated nothing. Academics have also tried to measure the links between intelligence and genius. But intelligence is not enough. Marilyn vos Savant, whose IQ of 228 is the highest ever recorded, has not exactly contributed much to science or art. She is, instead, a question-and-answer columnist for Parade magazine. Run-of-the-mill physicists have IQs much higher than Nobel Prize winner Richard Feynman, who many acknowledge to be the last great American genius (his IQ was a merely respectable 122). Genius is not about scoring 1600 on the SATs, mastering fourteen languages at the age of seven, finishing Mensa exercises in record time, having an extraordinarily high I.Q., or even about being smart. After considerable debate initiated by J. P. Guilford, a leading psychologist who called for a scientific focus on creativity in the sixties, psychologists reached the conclusion that creativity is not the same as intelligence. An individual can be far more creative than he or she is intelligent, or far more intelligent than creative. Most people of average intelligence, given data or some problem, can figure out the expected conventional response. For example, when asked, “What is one-half of 13?” most of us immediately answer six and one-half. You probably reached the answer in a few seconds and then turned your attention back to the text. THIR TEEN = 4 letters in each half. XIII = split in half XI/II = gives you 11 and 2 in Roman numerals. Or XIII divided in half horizontally gives you = 8 or VIII in Roman numerals. How would you describe the pattern in the following illustration? 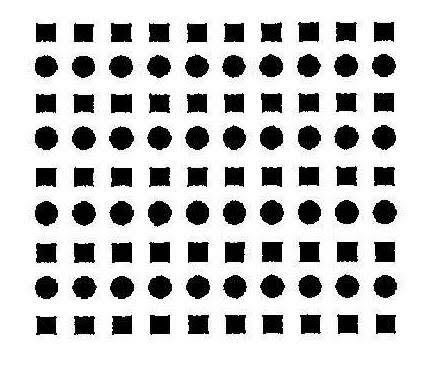 Most people see the pattern as a square composed of smaller squares or circles or as alternate rows of squares and circles. It cannot be easily seen as columns of alternate squares and circles. Once it’s pointed out that it can also be viewed as columns of alternate squares and circles, we, of course, see it. This is because we have become habituated to passively organize similar items together in our minds. Geniuses, on the other hand, subvert habituation by actively looking for alternative ways to look at things and alternative ways to think about them. Whenever Noble prize winner Richard Feynman was stuck on a problem he would invent new thinking strategies. He felt the secret to his genius was his ability to disregard how past thinkers thought about problems and, instead, would invent new ways to think. He was so “unstuck” that if something didn’t work, he would look at it several different ways until he found a way that moved his imagination. He was wonderfully productive. The problem 29 + 3 is considered a third-grade problem, because it requires the advanced technique of carrying; yet Feynman pointed out that a first grader could handle it by thinking 30, 31, 32. A child could mark numbers on a line and count off the spaces — a method that becomes useful in understanding measurements and fractions. One can write larger numbers in columns and carry sums larger than 10. Use fingers or algebra (2 times what plus 3 is 7?). He encouraged the teaching of an attitude where people are taught to figure out how to think about problems many different ways using trial and error. Reproductive thinking fosters rigidity of thought. This is why we so often fail when confronted with a new problem that is similar to past experiences only in superficial ways, or on the surface, and is different from previously encountered problems in its deep structure. Interpreting such a problem through the prism of past experience will, by definition, lead the thinker astray. Reproductive thinking leads us to the usual ideas and not to original ones. If you always think the way you’ve always thought, you’ll always get what you’ve always got — the same old, same old ideas. In 1923, Robert Millikan, noted physicist and winner of the Noble Prize, said there is absolutely no likelihood that man can harness the power of the atom. Fred Smith, while a student at Yale, came up with the concept of Federal Express, a national overnight delivery service. The U.S. Postal Service, UPS, his own business professor, and virtually every delivery expert in the U.S., doomed his enterprise to failure. Based on their experiences in the industry, no one, they said, will pay a fancy price for speed and reliability. When Charles Darwin returned to England after he visited the Galapagos, he distributed his finch specimens to professional zoologists to be properly identified. One of the most distinguished experts was John Gould. What was the most revealing was not what happened to Darwin, but what had not happened to Gould.Darwin’s notes show Gould taking him through all the birds he has named. Gould kept going back and forth about the number of different species of finches: the information is there, but he doesn’t quite know what to make of it. He assumed that since God made one set of birds when he created the world, the specimens from different locations would be identical. It never occurred to him to look for differences by location. Gould thinks that the birds are so different that they are distinct species.What is remarkable about the encounter is the completely different impact it has on the two men. Gould thought the way he has been conditioned to think, like an expert taxonomist, and didn’t see the textbook case of evolution that unfolded right before him with the finches. Darwin didn’t even know they were finches. The person with the intelligence, knowledge and the expertise didn’t see it, and the person with far less knowledge and expertise comes up with an idea that shapes the way we think about the world. I have always been impressed by Darwin’s theory of evolution by natural selection and have become fascinated with scholastic attempts to apply Darwinian ideas to creativity and genius. My own outlook about genius has roots in Donald Campbell’s blind-variation and selective-retention model of creative thought which he published in 1960. Campbell was not the first to see the connection between Darwinian ideas on evolution and creativity. As early as 1880, the great American philosopher, William James, in his essay “Great Men, Great Thoughts, and the Environment,” made the connection between Darwinian ideas and genius. Campbell’s work has since been elaborated on by a number of scholars including Dean Keith Simonton and Sarnoff Mednick. The work of these and many other scholars suggests that genius operates according to Darwin’s theory of biological evolution. Nature is extraordinarily productive. Nature creates many possibilities through blind “trial and error” and then lets the process of natural selection decide which species survive. In nature, 95% of new species fail and die within a short period of time. Genius is analogous to biological evolution in that it requires the unpredictable generation of a rich diversity of alternatives and conjectures. From this variety of alternatives and conjectures, the intellect retains the best ideas for further development and communication. An important aspect of this theory is that you need some means of producing variation in your ideas and for this variation to be truly effective, it must be “blind.” Blind variation implies a departure from reproductive (retained) knowledge. How do creative geniuses generate so many alternatives and conjectures? Why are so many of their ideas so rich and varied? How do they produce the “blind” variations that lead to the original and novel? A growing cadre of scholars are offering evidence that one can characterize the way geniuses think. By studying the notebooks, correspondence, conversations and ideas of the world’s greatest thinkers, they have teased out particular common thinking strategies and styles of thought that enabled geniuses to generate a prodigious variety of novel and original ideas. Following are thumbnail descriptions of strategies that are common to the thinking styles of creative geniuses in science, art and industry throughout history. GENIUSES LOOK AT PROBLEMS IN MANY DIFFERENT WAYS. Genius often comes from finding a new perspective that no one else has taken. Leonardo daVinci believed that to gain knowledge about the form of problems, you begin by learning how to restructure it in many different ways. He felt the first way he looked at a problem was too biased toward his usual way of seeing things. He would restructure his problem by looking at it from one perspective and move to another perspective and still another. With each move, his understanding would deepen and he would begin to understand the essence of the problem. Einstein’s theory of relativity is, in essence, a description of the interaction between different perspectives. Freud’s analytical methods were designed to find details that did not fit with traditional perspectives in order to find a completely new point of view. In order to creatively solve a problem, the thinker must abandon the initial approach that stems from past experience and re-conceptualize the problem. By not settling with one perspective, geniuses do not merely solve existing problems, like inventing an environmentally-friendly fuel. They identify new ones. GENIUSES MAKE THEIR THOUGHTS VISIBLE. The explosion of creativity in the Renaissance was intimately tied to the recording and conveying of a vast knowledge in a parallel language; a language of drawings, graphs and diagrams — as, for instance, in the renowned diagrams of daVinci and Galileo. Galileo revolutionized science by making his thought visible with diagrams, maps, and drawings while his contemporaries used conventional mathematical and verbal approaches. One of the most complete descriptions of Einstein’s philosophy of science was found in a letter to his friend, Maurice Solovine. In the letter, Einstein explained the difficulty of attempting to use words to explain his philosophy of science, because as he said, he thinks about such things schematically. 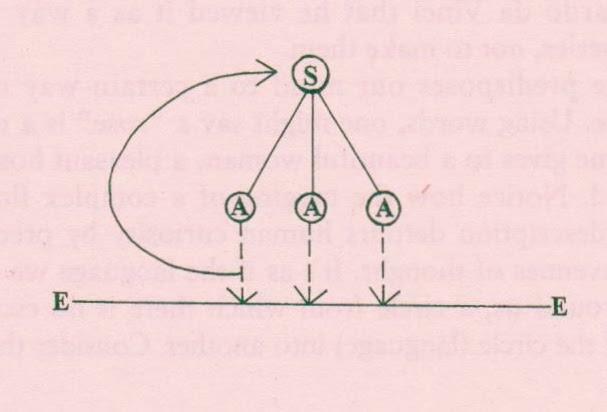 The letter started with a simple drawing consisting of (1) straight line representing E (experiences), which are given to us, and (2) A (axioms), which are situated above the line but were not directly linked to the line. Einstein explained that psychologically, the A rests upon the E. There exists, however, no logical path from E to A, but only an intuitive connection, which is always subject to revocation. From axioms, one can deduce certain deductions (S), which deductions may lay claim to being correct. In essence, Einstein was saying that it is the theory that determines what we observe. Einstein argued that scientific thinking is speculative, and only in its end product does it lead to a system that is characterized as “logical simplicity.” Unable to satisfactorily describe his thoughts in words, Einstein made his thought visible by diagramming his philosophy’s main features and characteristics. GENIUSES PRODUCE. A distinguishing characteristic of genius is immense productivity. Thomas Edison held 1,093 patents, still the record. He guaranteed productivity by giving himself and his assistants idea quotas. His own personal quota was one minor invention every 10 days and a major invention every six months. Bach wrote a cantata every week, even when he was sick or exhausted. Mozart produced more than six hundred pieces of music. Einstein is best known for his paper on relativity, but he published 248 other papers. T. S. Elliot’s numerous drafts of “The Waste Land” constitute a jumble of good and bad passages that eventually was turned into a masterpiece. In a study of 2,036 scientists throughout history, Dean Kean Simonton of the University of California, Davis found that the most respected produced not only great works, but also more “bad” ones. Out of their massive quantity of work came quality. Geniuses produce. Period. GENIUSES MAKE NOVEL COMBINATIONS. Dean Keith Simonton, in his 1989 book Scientific Genius, suggests that geniuses are geniuses because they form more novel combinations than the merely talented. His theory has etymology behind it: cogito — “I think — originally connoted “shake together”: intelligo the root of “intelligence” means to “select among.” This is a clear early intuition about the utility of permitting ideas and thoughts to randomly combine with each other and the utility of selecting from the many the few to retain. Like the highly playful child with a pail full of Legos, a genius is constantly combining and recombining ideas, images and thoughts into different combinations in their conscious and subconscious minds. Consider Einstein’s equation, E=mc2. Einstein did not invent the concepts of energy, mass, or speed of light. Rather, by combining these concepts in a novel way, he was able to look at the same world as everyone else and see something different. The laws of heredity on which the modern science of genetics is based are the results of Gregor Mendel who combined mathematics and biology to create a new science. GENIUSES FORCE RELATIONSHIPS. If one particular style of thought stands out about creative genius, it is the ability to make juxtapositions between dissimilar subjects. Call it a facility to connect the unconnected that enables them to see things to which others are blind. Leonardo daVinci forced a relationship between the sound of a bell and a stone hitting water. This enabled him to make the connection that sound travels in waves. In 1865, F. A. Kekule’ intuited the shape of the ring-like benzene molecule by forcing a relationship with a dream of a snake biting its tail. Samuel Morse was stumped trying to figure out how to produce a telegraphic signal enough to be received coast to coast. One day he saw tied horses being exchanged at a relay station and forced a connection between relay stations for horses and signals. The solution was to give the traveling signal periodic boosts of power. Nickla Tesla forced a connection between the setting sun and a motor that made the AC motor possible by having the motor’s magnetic field rotate inside the motor just as the sun (from our perspective) rotates. GENIUSES THINK IN OPPOSITES. Physicist and philosopher David Bohm believed geniuses were able to think different thoughts because they could tolerate ambivalence between opposites or two incompatible subjects. Dr. Albert Rothenberg, a noted researcher on the creative process, identified this ability in a wide variety of geniuses including Einstein, Mozart, Edison, Pasteur, Joseph Conrad, and Picasso in his 1990 book, The Emerging Goddess: The Creative Process in Art, Science and Other Fields. Physicist Niels Bohr believed that if you held opposites together, then you suspend your thought and your mind moves to a new level. The suspension of thought allows an intelligence beyond thought to act and create a new form. The swirling of opposites creates the conditions for a new point of view to bubble freely from your mind. Bohr’s ability to imagine light as both a particle and a wave led to his conception of the principle of complementarity. Thomas Edison’s invention of a practical system of lighting involved combining wiring in parallel circuits with high resistance filaments in his bulbs, two things that were not considered possible by conventional thinkers, in fact were not considered at all because of an assumed incompatibility. Because Edison could tolerate the ambivalence between two incompatible things, he could see the relationship that led to his breakthrough. GENIUSES THINK METAPHORICALLY. Aristotle considered metaphor a sign of genius, believing that the individual who had the capacity to perceive resemblances between two separate areas of existence and link them together was a person of special gifts. If unlike things are really alike in some ways, perhaps, they are so in others. Alexander Graham Bell observed the comparison between the inner workings of the ear and the movement of a stout piece of membrane to move steel and conceived the telephone. Thomas Edison invented the phonograph in one day, after developing an analogy between a toy funnel and the motions of a paper man and sound vibrations. Underwater construction was made possible by observing how shipworms tunnel into timber by first constructing tubes. Einstein derived and explained many of his abstract principles by drawing analogies with everyday occurrences such as rowing a boat or standing on a platform while a train passed by. GENIUSES PREPARE THEMSELVES FOR CHANCE. Whenever we attempt to do something and fail, we end up doing something else. As simplistic as this statement may seem, it is the first principle of creative accident. We may ask ourselves why we have failed to do what we intended, and this is the reasonable, expected thing to do. But the creative accident provokes a different question: What have we done? Answering that question in a novel, unexpected way is the essential creative act. It is not luck, but creative insight of the highest order. Alexander Fleming was not the first physician to notice the mold formed on an exposed culture while studying deadly bacteria. A less gifted physician would have trashed this seemingly irrelevant event but Fleming noted it as “interesting” and wondered if it had potential. This “interesting” observation led to penicillin which has saved millions of lives. Thomas Edison, while pondering how to make a carbon filament, was mindlessly toying with a piece of putty, turning and twisting it in his fingers, when he looked down at his hands, the answer hit him between the eyes: twist the carbon, like rope. B. F. Skinner emphasized a first principle of scientific methodologists: when you find something interesting, drop everything else and study it. Too many fail to answer opportunity’s knock at the door because they have to finish some preconceived plan. Creative geniuses do not wait for the gifts of chance; instead, they actively seek the accidental discovery. Recognizing the common thinking strategies of creative geniuses and applying them will make you more creative in your work and personal life. Creative geniuses are geniuses because they know “how” to think, instead of “what” to think. Sociologist Harriet Zuckerman published an interesting study of the Nobel Prize winners who were living in the United States in 1977. She discovered that six of Enrico Fermi’s students won the prize. Ernst Lawrence and Niels Bohr each had four. J. J. Thompson and Ernest Rutherford between them trained seventeen Nobel laureates. This was no accident. It is obvious that these Nobel laureates were not only creative in their own right, but were also able to teach others how to think creatively. Zuckerman’s subjects testified that their most influential masters taught them different thinking styles and strategies rather than what to think. Michael Michalko is the author of the highly acclaimed Thinkertoys: A Handbook of Creative Thinking Techniques; Cracking Creativity: The Secrets of Creative Genius; ThinkPak: A Brainstorming Card Deck and Creative Thinkering: Putting Your Imagination to Work. These books contain the creative thinking techniques used by creative geniuses throughout history to create their original and novel ideas.